Elisa Yang loves birds, and she won’t take no for an answer. Today we’re taking you back to high school, to meet some teenage birders. They’re a species rarely seen in the wild. It’s kind of hard to be a teen birder. You’re most likely the only one in your school. And if you do find friends who bird, they probably live hours away. And then, even if you’re old enough to have your driver’s license, you can’t just take off for a weekend birding trip.. Would your parents have let you borrow the car, pick up some kids you met on the internet, and camp out in a national park? So what do you do? Elisa Yang has been working for years to figure it all out. 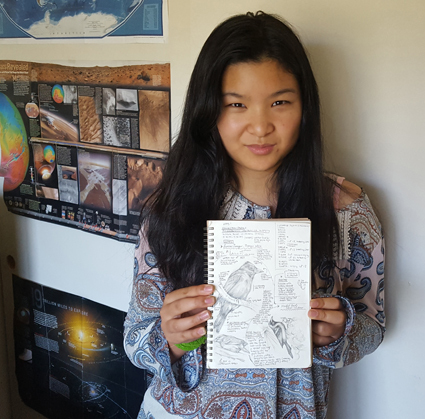 She’s 17, and the president of the California Young Birders Club. When Elisa was a freshman in high school, she wanted to join a young birders club. 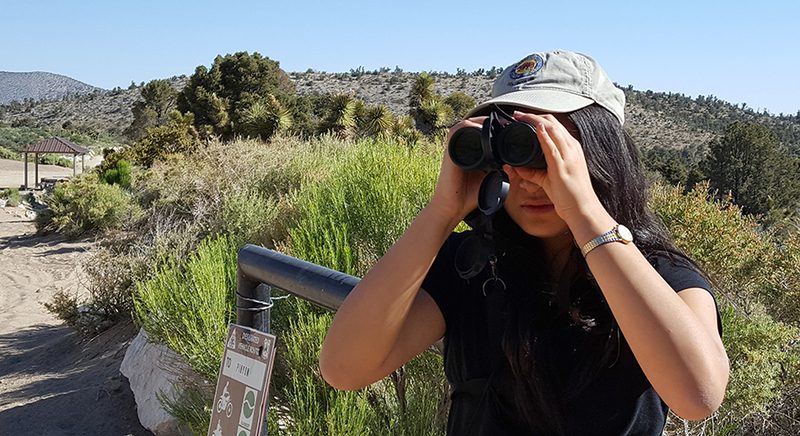 Most birding field trips are geared toward adults, and Elisa says it can feel awkward when you’re the only person under 18 there, with no one your age to talk to. Elisa searched but couldn’t find a young birders club anywhere in California. 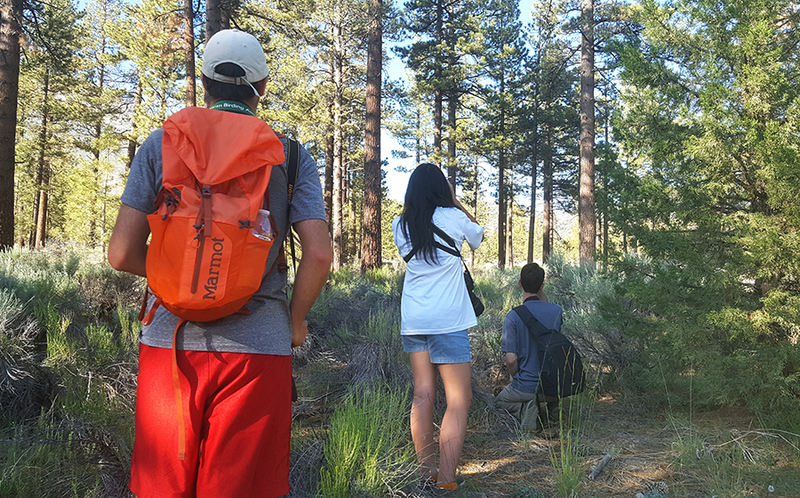 Lots of other states have young birder groups, but why not a state as huge and diverse as California? “I was, like, ‘This isn’t great. I should create one,’” she says. It started off slowly. Without insurance, her local Audubon chapter told her it wouldn’t work. She created a website and made a few calls, but the project stalled. Then in 2015, Elisa got an email from Monte Taylor, an adult birder looking to help. Elisa is worried, though. She’s going to graduate from high school soon. What if this thing that she’s worked so hard to build falls apart after she’s gone? Once Elisa graduates high school, her parents won’t be involved in the club anymore. Other key club members are also about to graduate, too. These teens are passionate, serious birders. 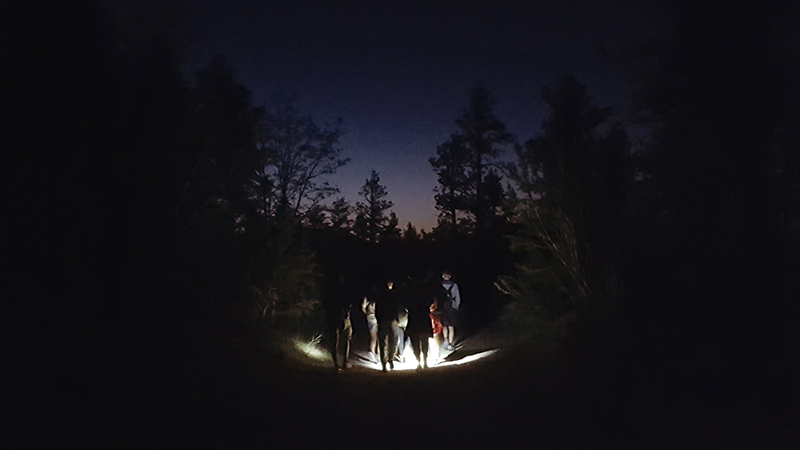 We spent two days camping and hiking with them through the San Bernardino National Forest. Shahla Farzan for BirdNote. 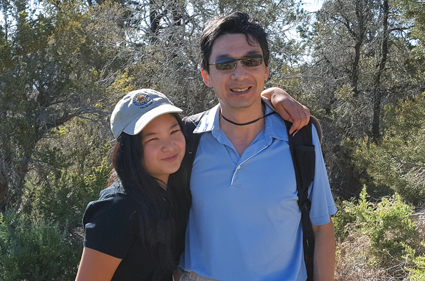 Elisa has organized eight trips for the California Young Birders just this year. It’s early June, when I meet up with Elisa and her friends in the San Bernardino National Forest. We’re planning to camp overnight and spend two days birding at different sites around the area. These kids have been to birding camps, they have special bird apps on their phones, and they have lists of birds they’d like to see one day. So yeah, they’re serious birders. But at the same time, they’re still teenagers. In between searching for birds, Elisa and her friends stop on the trails again and again to point out interesting butterflies and insects, or unique flowers. And of course they’re filing to eBird, taking plenty of photos for their bird photo blogs, and selfies for Instagram. Spotting some baby Mountain Quail gives the group a thrill. The mom’s dark plume atop her head looks like a little exclamation point. The peeping chicks run about as the kids take pictures. 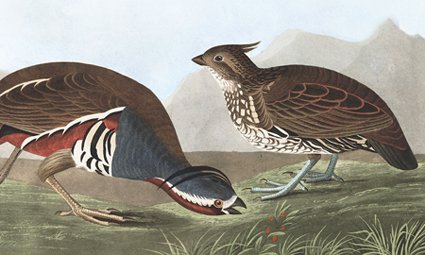 John James Audubon’s beautiful take on the bird now known as the Mountain Quail. Courtesy of the National Audubon Society. Elisa and her dad do most of the trip planning. And sometimes it can be stressful. She wants to make sure everyone’s having fun and seeing the birds they came for. “Honestly, I think people are most happy, not necessarily even when they see the most birds, but when they get along with everyone else and just sort of laugh and have a good time together you know? So that’s what I really try to work on,” Elisa says. Elisa Yang and her father Rong Yang. “The cancellations and last-minute plan changes, it happens every time. Every trip. So it’s really stressful,” Rong says. “But once you go through this, at the end of each trip, everybody’s happy. So I think it’s worth the trouble.” Shahla Farzan for BirdNote. Rong says they had to change plans for this trip several times, as kids dropped out. Rong says it’s incredibly rewarding to spend so much time with his teen daughter. There wasn’t a community for young birders, so Elisa and her friends created one. But they only ever get a few days together. Shahla Farzan for BirdNote. It’s almost dark, but the teens have one more birding spot on their list: Green Canyon. They’re hoping to see the Mexican Whip-poor-will. It’s a secretive bird that comes out to forage at dusk and dawn. We caravan down a rocky dirt road that looks more like a washed out old riverbed. Soccer ball-sized rocks litter the road. Rong swerves the car around them. We get about a half-mile down the road before realizing that Rong’s Honda Accord just isn’t going to make it. After a quick conference, the birders decide to hike in the rest of the way. We round a corner and find a group of seven adult birders already camped out. They’re also hoping to catch a glimpse of the Mexican Whip-poor-will. And they look a little dismayed to see the younger birders. The group waits in uncomfortable silence. As the last bit of the sunlight fades away, the moths come out. Little brown bats swoop over our heads, but still no whip-poor-will. The birders strain to hear its distinctive call. Then, just like that, the wait is over. The whip-poor-will flies directly in front of the group and grabs a moth. It’s so close, you can hear its feathers rustle. After a couple minutes, one of the adult birders comes over to the group. Young and old birders share in their glee in seeing the life bird. The older birder shares tips on hotspots in the park. The tension evaporates. Back at the campsite, everyone’s still feeling a little giddy. The teens collect a small pile of twigs and squeeze around the fire pit, and try to get a campfire going. They roast marshmallows and tell stories into the night. There wasn’t a community for young birders, so Elisa and her friends created one. But they only ever get a few days together. Tomorrow they’ll be splitting up and heading back to different towns across southern California. “We're all just a bunch of normal teenagers. We talk like normal teenagers and we do normal teenager things, like taking Instagram photos and Snapchat selfies and all that. We’re not special. Being a birder doesn’t make you weird or special in any way. I think birding is a pretty normal thing to do.” Shahla Farzan for BirdNote. “Honestly, the difference between adult birders and teenage birders is pretty much the same as the difference between adults and teens,” says Elisa. "I just know I want to do something that has to do with birds. And that's pretty much all I know for certain." For Elisa, birding isn’t just some kind of passing fad. Birds are a big part of her life. And definitely a part of her future. Elisa says that when she gets older, she wants to become a writer and write about nature and birds. And maybe work at a natural history museum. And maybe be a research professor. “And then I'm really hoping to go to Cornell for grad school, because that's where the Lab of Ornithology is,” she says. She just wants to do something having to do with birds and ornithology. This podcast is made possible by the Falconer Family of Seattle and the Peg and Rick Young Foundation, with additional support from The Bobolink Foundation. Our incredible music discovered through the Free Music Archive, a service of WFMU. “Budding” by Broke for Free, CC License. “Grow Grotesque” by Doctor Turtle, CC License. “Doom” by Colin L. Orchestra. “Soon” by Hicham Chahidi. And BirdNote’s theme remix by DJ Ecotone.